Power’s Micheal Makiadi (right) tries to stop Oliers’ Landry Ndikumana from converting a jump shot yesterday. Photo by Shaban Lubega. 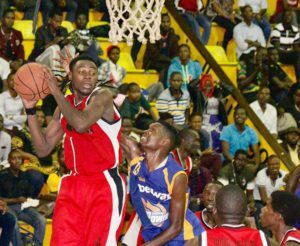 BASKETBALL–Micheal Makiadi put up urguably the best performance of the season so far as his power side defeated defending champions City Oliers 75-70 in overtime at the Lugogo indoor stadium yesterday evening. Makiadi registered a double-double in terms of points and assists for the fourth time this season as he scored a game high 25 points and 16 rebounds. It was not a roller coaster for Power as they struggled in the first quarter with Oliers coming out of the blocks with intensity registering 18-12 in terms of points. At half time, it was as if Oilers where just the referees final whistle away from registering their eleventh win of the campaign as they held a 19-point lead with the score board reading 36-17 in their favour. Micheal Makiadi inspired Power to start a fight back scoring seven points in the process and registering vital defensive rebounds and by the end of the third quarter, Oilers lead had been reduced to 11 as it ended 52-41. Power went on a run of 9-0 at the start of the final 10 minutes with Oliers lead trimmed to just a mere two points and wit 3:35 to play on the clock, Power took its first lead in the game as the board read 57-56. Landry Ndikumana saved Oilers blushes with a three pointer with only three seconds to play and ensure that the game goes to over time. In over time, Power never looked back as the made eight unanswered points to take a healthy 73-65 lead with just over three minutes to play and clearly Olires had lost it and could not much the energy the league leaders possessed conceding a 75-70 defeat in the process at the sound final buzzer. Power are leading the Mens’ division on 14-4 and Oilers who have four games in hand still on a record of 10-4 going into the zone five basket ball championships that start on Sunday. In the other game played on the night, KCCA Leopards three late free throws to over come a resilient UCU side 62-61 in another thrilling encounter. KCCA still lead the women’s standings with a record of 14-0 with UCU second on 11-2.